Nang Chi, Wat Rong Tham and Wat Kudi Dao. temple sites it was 300 steps (260 m). All together including the width of the canals we arrive at about 760 steps or 650 meters. 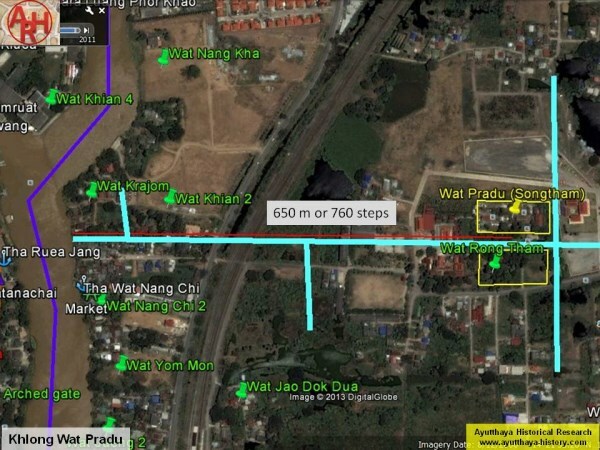 100 steps; than the temple indicated right below, on the east bank, should be Wat Kudi Dao. 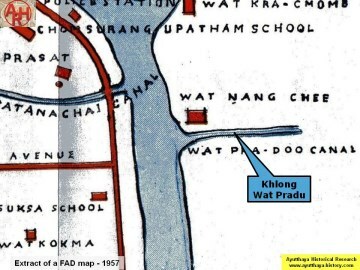 two options for Khlong Wat Pradu as can be seen on the map. (on the FAD 1974 map it runs north of Wat Pradu). 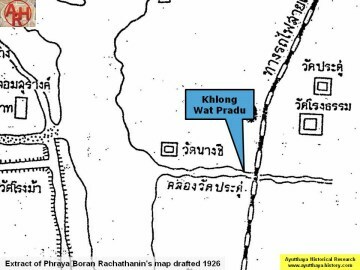 We can as thus state that Khlong Wat Pradu in earlier times ran north of Wat Nang Chi and in between between Wat Pradu and Wat Rong Tham. (Khlong Ayodhya - Khlong Kudi Dao ran east of Wat Kudi Dao). Wat Nang Chi) is wrong. 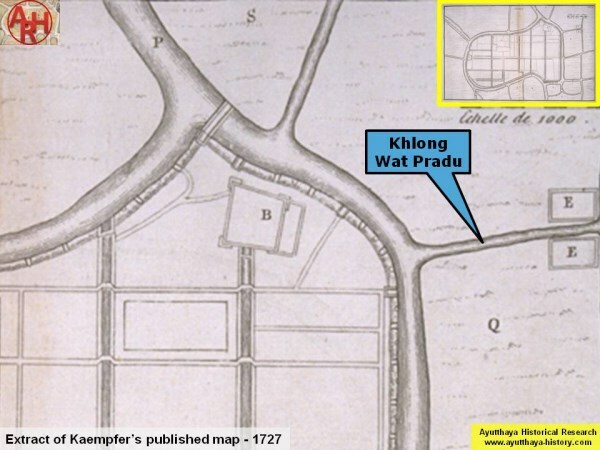 The canal indicated on both maps could have been an unnamed waterway running parallel with Khlong Wat Pradu. cremation of Chaomae Watdusit in 2333 BE. …. Chao Phraya Kosa Lek Pan, took place at Wat Pradu and not at Wat Samana Kottharam as stated by the Fine Arts Department. On Kaempfer's published map of 1727 we find a denomination on the two temples sites marked E being "E. The Courts of Berklam’s temple". 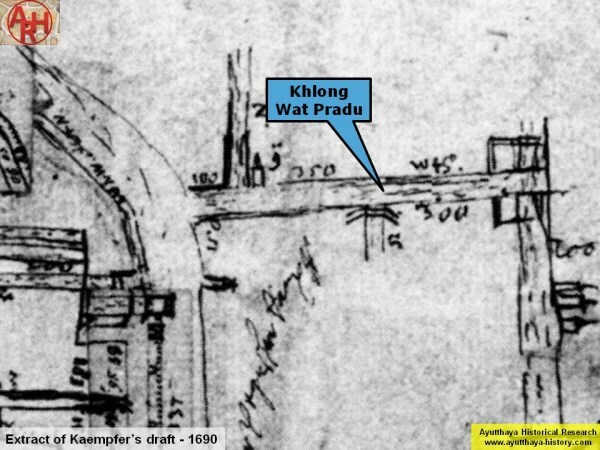 Unless Engelbert Kaempfer interpreted something wrong, Wat Pradu and Wat Rong Tham were as thus the sponsored temples by the Phrakhlang. 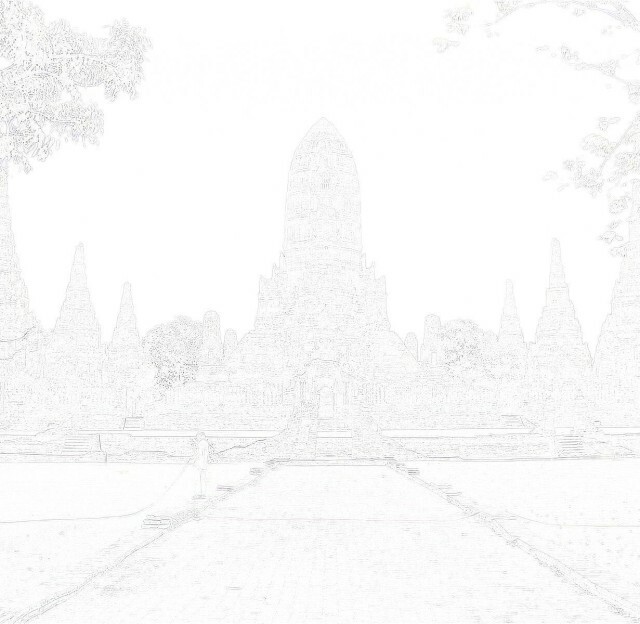 (1) The premises of Wat Rong Tham and Wat Pradu were merged to become Wat Pradu Rong Tham, presently known as Wat Pradu Song Tham. The renaming of "Rong" by "Song" seems to come from the following: "rong" which means building, sounds also as coffin (Th: long). The word "rong"
Wat Kalayaram) and Wat Tha Ka Rong (Wat Tha & Wat Ka Rong). 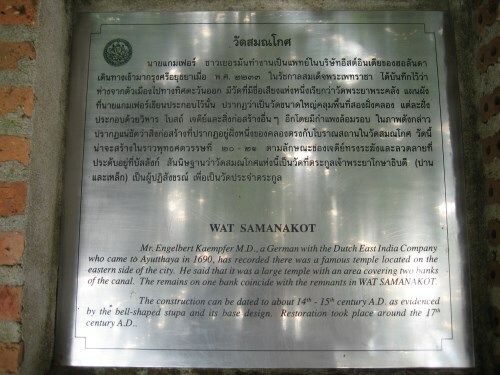 of the ruin of Wat Nang Kham. (3) Phra Khlang was the minister of foreign affairs and trade in the Ayutthayan era. 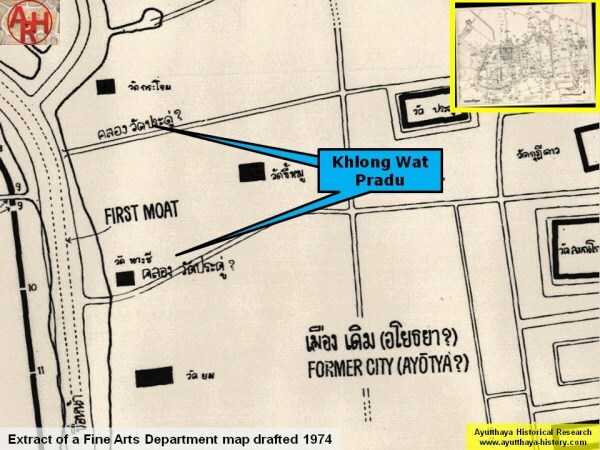 Jumsai, Sumet - The reconstruction of the city plan of Ayutthaya (1970) - The Siam Society, Bangkok - page 308. Terwiel, Barend Jan - Engelbert Kaempfer in Siam (2003) - IUDICIUM Verlag GmbH Munchen - page 16. With special thanks to Chris Baker for helping me out with a number of documents.